Learning grids are a fantastic resource that can be used across different subjects and with different year groups/key stages. If you are not familiar with this resource it is simple; it is a grid consisting of 36 boxes ( 6 vertical and 6 horizontal). Dice are required – dice can be bought cheaply online or at stores such as Poundland or Tiger. Pupils will roll the dice twice – to give them a number they can use for the horizontal and vertical line (for example 2 across and 4 down). I have used learning grids in a variety of ways; to re-cap previous learning, support literacy, as a plenary and much more! The idea of a linking learning grid is more complex and challenging. A linking grid requires pupils to have an overview of a topic, it is a good activity for consolidating and revising subject knowledge, as well as checking understanding of subject specific vocabulary. This resource is best used at the end of a unit or for revision. 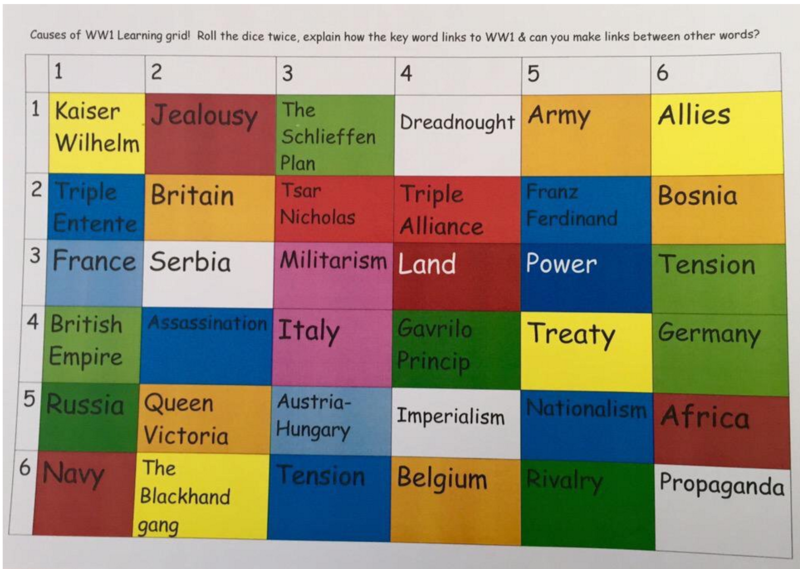 The example above is a linking grid I made for a Year 9 History lesson, with 36 boxes all connected to what pupils had been studying and learning about WW1. Pupils roll the dice twice to land on a box. Pupils then explain the connection between that keyword to WW1 – for example how does the Kaiser link to WW1? Then roll again to land on another box – but then with the second keyword pupils had to link it to the previous word. For example, if the first box they landed on was Kaiser Wilhelm, a pupil would say he was the leader of Germany in 1914 when war broke out (hopefully building on that answer further). Then after rolling the dice twice and having an additional keyword they would link that word back to the Kaiser, if they can, as some links are obvious but others can be more of a challenge. So, if the second box the pupil landed on was ‘Militarism’ then that links to Kaiser Wilhelm because he was involved in an arms race that eventually led to WW1 and so on. It can be complicated to explain to pupils but I modelled the game with two demonstrations and then they grasped it. They made some excellent connections and links between factors. I was really impressed with their answers and explanations. A pupil told me they enjoyed it because it made them “think then link!”. 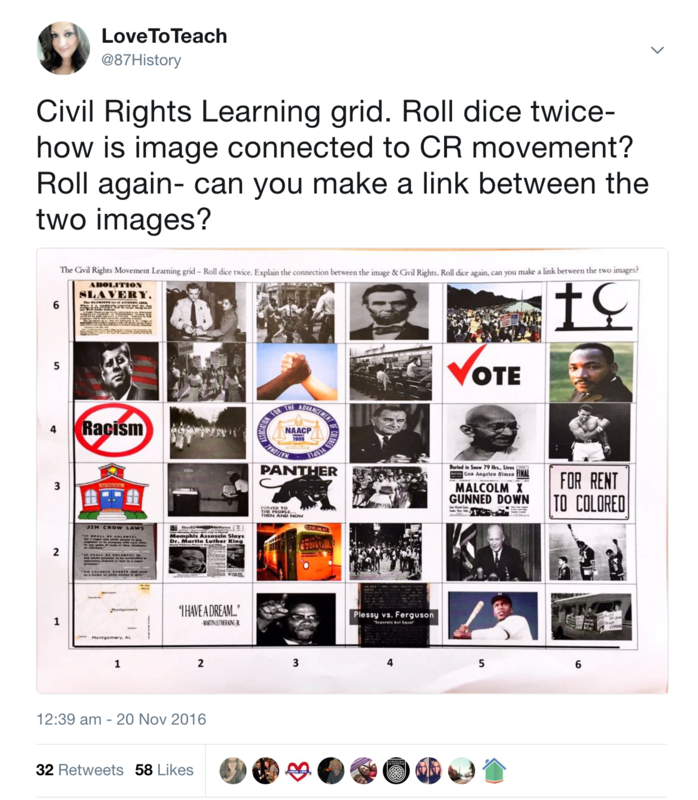 After the success of this resource I then adapted the linking grid as a revision activity for my GCSE pupils studying the Civil Rights Movement in the USA. This resource is available to download for free here. In comparison to the example above, instead of using keywords I included images that represented different factors. 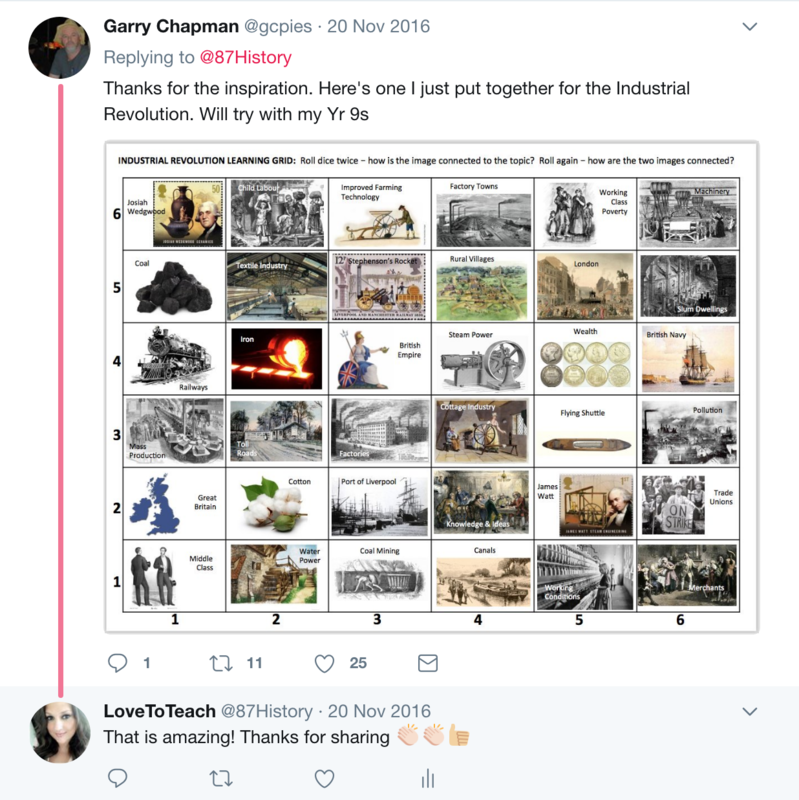 After sharing this resource on Twitter several History teachers, from across the world, adapted my idea for their pupils to make connections between factors related to topics their pupils were studying. 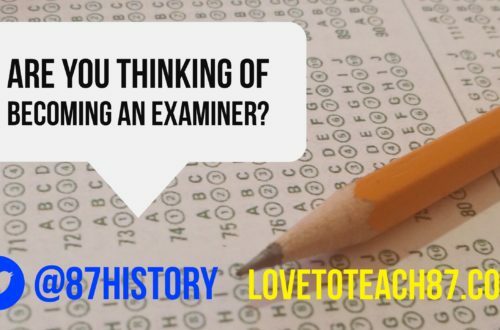 Currently, I am Head of History and my timetable is dedicated to teaching History, but previously I have taught other subjects including RE and Geography therefore I can see the potential this resource can have in other subjects. I think this resource could be used well with English Literature and Drama, exploring connections between themes and characters. 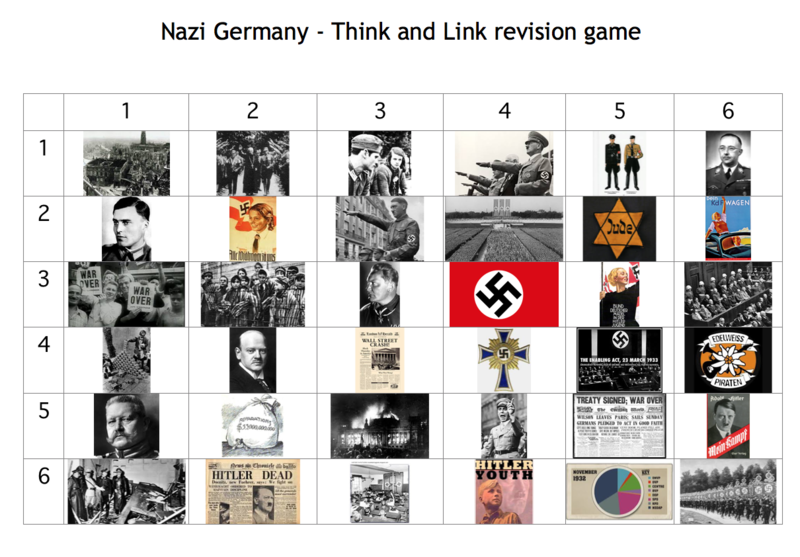 Another idea would be for pupils to create their own linking grid; as shown below with a GCSE example that pupils then played together as a challenging and enjoyable revision activity. 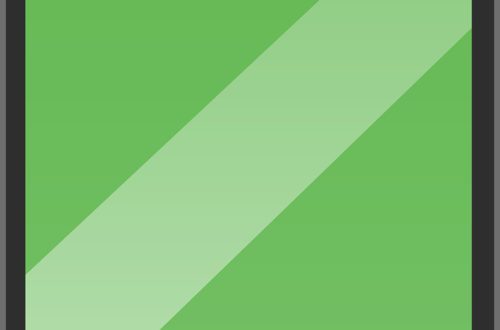 The linking grid encourages pupils to make explicit links between connecting factors which is often a requirement with extended exam answers and essays. 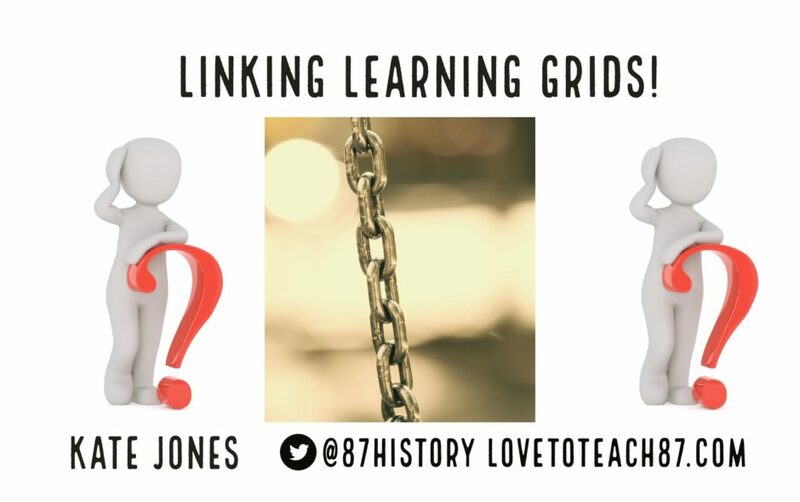 I currently use linking grids with pairs or small groups but obviously this idea has the potential to be used on a larger scale with whole class discussions, sharing subject knowledge and making explicit links and connections. If you are interested in reading about other ways I have used learning grids with my pupils you can read my previous blog here. Thanks for taking the time to read my post. 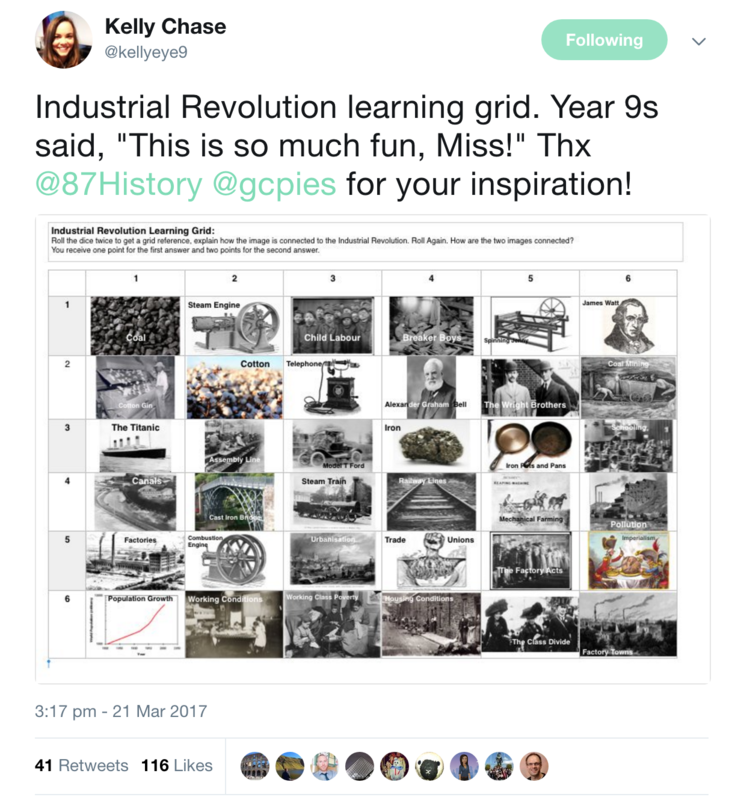 If you’ve been inspired by any of these ideas I’d love to hear from you to find out how you’ve taken them or adapted learning grids and used them in your classroom. Please feel free to follow my blog and leave comments below or why not just drop me a message on Twitter . Using Green Screen in the classroom!